They are hunted for their bodies, trawled from the bottom of the sea, and captured for personal amusement. Although we are starting to understand the consequences of our actions, we still have a lot to do to mitigate our impact to the environment. This is where the IUCN Red List comes in. It is a list which catalogs organisms, their conservation status, and threats to their survival. It serves as guidance for decision-makers to choose what to prioritize and what measures can be taken to conserve the species. Due to time and resource limitations the list is far from complete and it is possible that some organisms will become extinct before they are even classified. While the IUCN Red List has multiple tiers of conservation status, this article profiles those classified as Critically Endangered – meaning that the species has a high risk of extinction in the wild. Here is a list of 16 animals that are classified as Critically Endangered in 2016 in no specific order. Pangolins make up the 8 living species of the family Manidae. They are nocturnal mammals that feed on ants and termites with their specialized tongue. They are covered in scales made of keratin, the same substance found in our fingernails and hair. 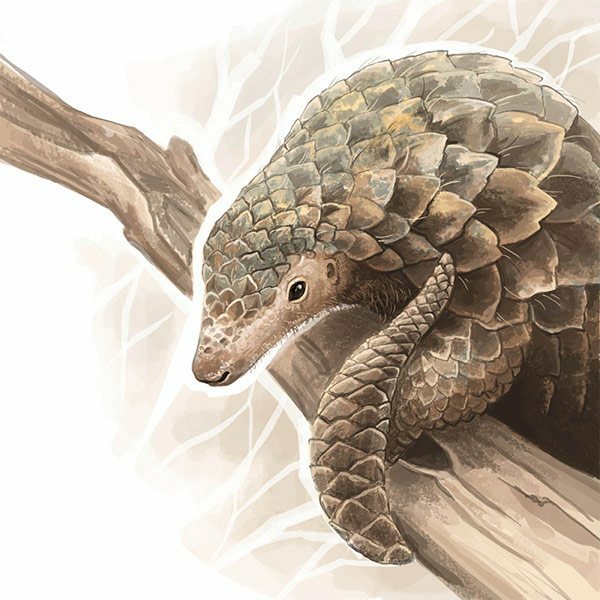 In the wild, pangolins are threatened by deforestation and hunting. They are also popular as bushmeat and their meat is a delicacy in China and Vietnam. Pangolin scales are said to have medicinal qualities which increases the demand and results in illegal trafficking. Because of this activity, all 8 species of pangolin are on the IUCN Red List – 4 being listed as Vulnerable, 2 Endangered and 2 Critically Endangered. The horns, meat, and skin of this long-nosed antelope are known to have commercial value. In particular, the horns are used in Chinese medicine; where the demand has wiped out the saiga population in China. As a result, the saiga is a Class 1 Protected Species in the country which, unfortunately, drives poaching and smuggling. Expanding human populations and advances in agriculture have resulted in the shrinking of the saiga’s habitat since the 20th century. On top of this, their migration route through 5 different countries is blocked by many physical barriers, such as fences and man-made constructions (including railways and mines) that limit their movement. There are reported cases of saiga herds that have starved to death when unable get past barbed wire fences between Kazakhstan and Uzbekistan. In 2015, over 200,000 Saigas in Kazakhstan succumbed to bacterial infection, making it one of the worst mammal die-offs ever recorded. 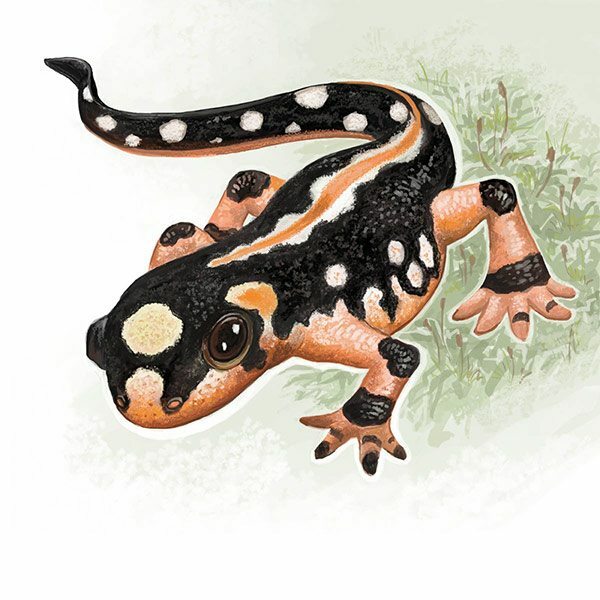 The Kaiser’s spotted newt is a species of salamander endemic to the Zagros Mountains in Iran where they populate mountain streams and the surrounding scrubland. When water is absent from their habitat these newts move into woodland where they enter a state of dormancy, or estivation, to avoid desiccation. Populations of the little amphibian have been in decline due to habitat loss and illegal capture for wild animal trade. Despite being classified as critically endangered they are often sold as captive bred animals for the pet trade as they can be kept easily and are relatively hardy animals. Luckily, their resilience makes captive breeding programs largely successful. 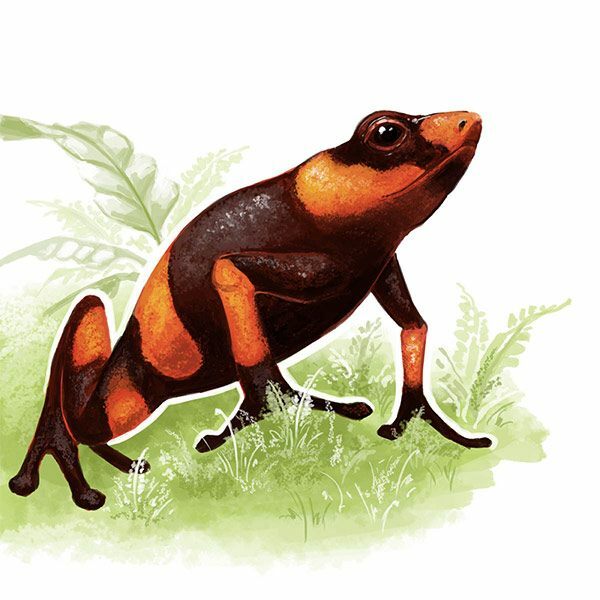 Living in submontane tropical rainforests of western Colombia is the tiny red-banded poison frog that grows to a snout-to-vent length of 36mm (1.4 inches). This frog has a brown coloration with bright contrasting bands across its body that can be red, orange or yellow. The striking coloration of this frog is an indicator to predators that it is inedible. While in the wild this frog is toxic due to its diet, it may lose its toxicity in captivity. The habitat of these frogs is declining from timber extraction and illegal agriculture. Although this poisonous frog is both listed as Critically Endangered and a protected species it can still be found in the international pet trade, although it is known to be a very delicate species that only the most experienced handlers can tackle. 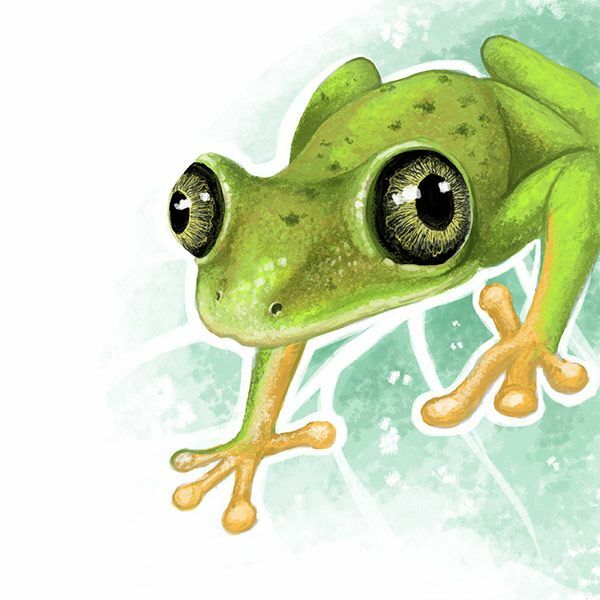 The lemur leaf frog is a bright green frog which can grow up to 45mm in length. These frogs are found in Colombia, Costa Rica, and Panama, and their natural habitats are lowland forests, tropical and subtropical forests, rivers and marshes. Populations suffer from general habitat loss and Chytridiomycosis - an infectious fungal disease in amphibians, caused by the Batrachochytrium dendrobatidis fungi. This fungus is responsible for a number of amphibian extinctions and has affected about 30% of the world’s amphibian species. Fortunately, some populations of the lemur leaf frog are showing signs of resistance to these fungi and scientists predict they could be a species that could survive the fungus. Additionally, these frogs could be vitally important for research as they have shown resistance to cancer and bacterial infections. With conservation efforts, further studies on these frogs could be crucial for human medicine. The hooded vulture is an old-world vulture that is native to sub-Saharan Africa. Locals refer to these birds as “garbage collectors” as they scavenge on carcasses of dead animals and other waste including landfills and abattoirs. This bird is relatively common and can be seen soaring in flocks. 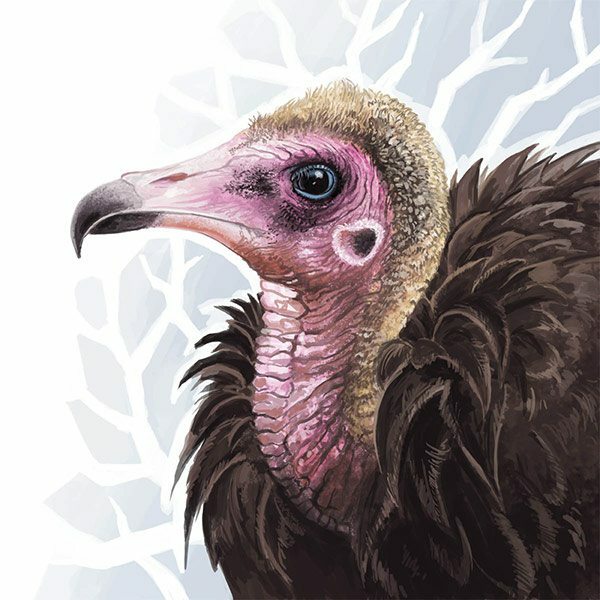 However, due to a steep decline in population, from various factors including poisoning, hunting, and habitat loss, hooded vultures are on the IUCN Red List as Critically Endangered. In some places, carcasses have been intentionally poisoned to kill off scavenging animals that try to feed on them. In some cases, the heads of dead vultures have been cut off and sold for Traditional African Medicine. In other cases, the killing of vultures is malevolent – big game poachers who slaughter for ivory also poison the carcasses of the animals, because circling vultures can alert authorities to the illegal poaching. Between 1993 and 2000 a mass decline in vultures in India resulted in rotting and decomposing cattle carcasses in the streets causing an increase in wild dogs which in turn produced a rise in the number of cases of rabies. 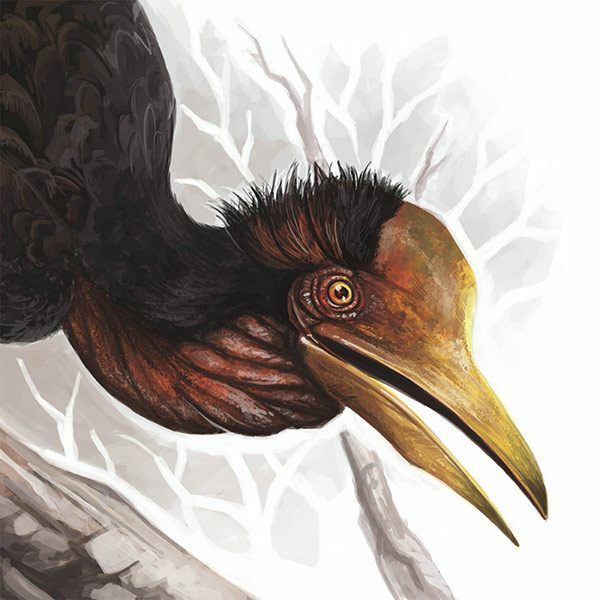 Helmeted hornbills are odd birds, from having helmets to their breeding behavior. For roughly half a year, the nesting female is sealed into a natural hole to care for a nest, and the male brings the female food. The death of the male can result in the deaths nesting female and chick. These birds have a large solid lump of keratin on their beak, called a casque, which they use when defending their territory by ramming each other. However, it is this casque that’s a factor causing their population to decline; hornbills are hunted and their heads are sold to be used in traditional medicine or the casques are used for carvings. One research published in 2015 by Y. Hadiprakarsa stated that in West Kalimantan, as many as 500 birds were being killed every month in 2013, resulting in an annual loss of 6,000 individuals. Along with the severe hunting pressure for its casque, logging and agricultural conservation are also causing the hornbill’s population to decline. As trees are removed from the habitat there are fewer nesting sites and feeding sites since the hornbill’s diet consists of mostly fruit. Also known as the owl parrot, the kakapo is a flightless, nocturnal species of parrot native to New Zealand. Like the extinct dodo, kakapos are unable to fly away from predators or threats. When humans (the Māori) arrived in New Zealand, kakapos were hunted for food, their feathers, and skin. Being flightless, the kakapo were easy prey for the Māori and their dogs. The Māori also brought Polynesian rats to New Zealand which preyed on kakapo chicks and eggs. In the 1840s their habitat was further reduced by European settlers who cleared vast areas of land for farming and livestock. With the European settlers came more cats, dogs, rats and stoats, which, like Māori, hunted and ate kakapo. 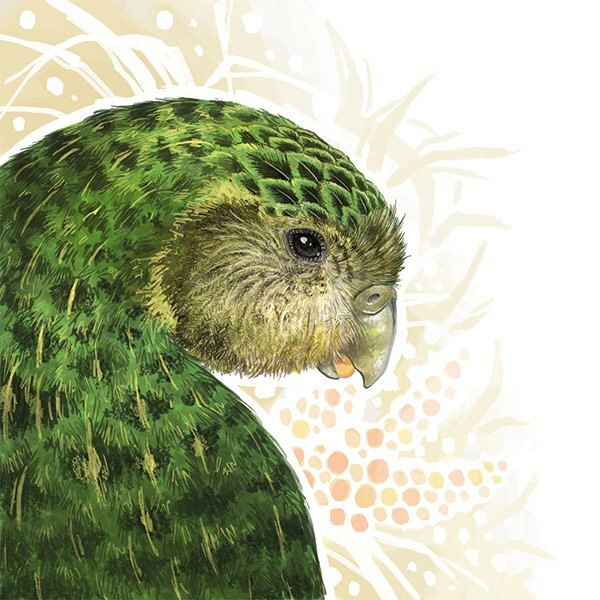 The introduction of the predatory mammals almost wiped out the kakapo. Realizing that the population of kakapo was dwindling, collectors captured or killed as many of these birds as possible, which unfortunately triggered the unsuccessful conservation efforts in the 1890s. In the 1980s a recovery plan was implemented and in recent years, the breeding plans have been successful. Kakapos are now kept on predator-free islands, where they are closely monitored. As of June 2016, there are 123 known adults and their population is steadily increasing. Yes, corals are animals too! 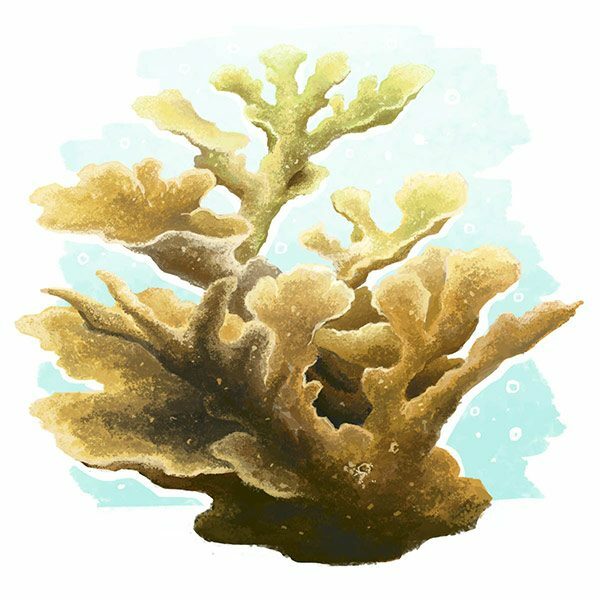 This particular species is a very important reef-building coral found in the Caribbean and can grow up to 3.6 meter (12ft) in diameter. The structure of the coral creates habitats for many reef-dwelling species of fish, crustaceans, molluscs and echinoderms, making it crucial for the survival of countless other creatures nearby. Since the 1980s there has been a 90% population decline and threats include disease, coral bleaching, predation by snails and fish, storm damage and human activity. Many corals depend upon symbiotic relationships with algae or other photosynthetic microorganisms. Coral bleaching happens when corals expel these useful microorganisms under environmental pressures such as water temperature and salinity changes. It can be reversed if the microorganisms return to the coral but only if environmental conditions become more stable. Natural recovery of coral is a slow process, but may never occur for this species as so many factors inhibit its survival. There have been mixed results from conservation efforts which include reattaching and/or culturing coral fragments, reintroducing herbivores to eat harmful algae, and removing coral predators. The natural habitat of the metallic tarantula is the deciduous forests of Andhra Pradesh, India. Feeding on flying insects these arboreal spiders live in holes in trees where they construct asymmetric funnel webs. 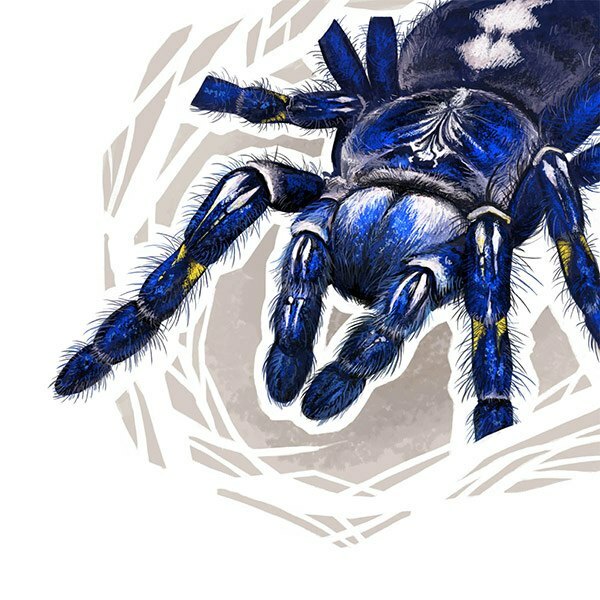 These spiders possess a venom which can cause intense pain, fortunately, there has not been a recorded human death caused by their bite. Most bites from this species are classed as “dry bites” where no venom is injected. Metallic tarantulas are hardy arachnids that can live for up to 12 years. Combined with their brilliant coloration, this makes them desirable for enthusiasts and the pet trade causes a high demand for their live capture. The wild population size is currently unknown, but their small, fragmented habitat range is continually decreasing as a result of firewood harvesting and logging. Echidnas are strange mammals that are a part of a group called Monotremes. Monotremes are native to Australia and New Guinea, consisting of echidnas and the duck-billed platypus. Unlike other mammals, which give birth to live young, monotremes lay eggs like birds or reptiles. 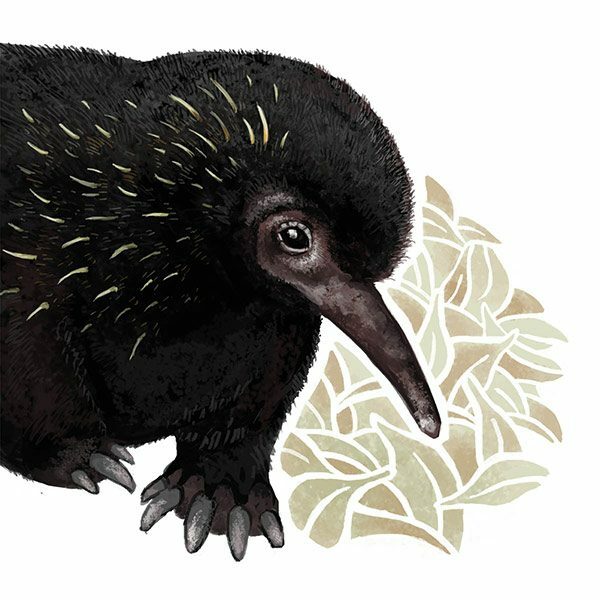 There are three species of long-beaked echidnas that are all native to New Guinea – Sir David’s long-beaked echidna (Z. attenboroughi), the eastern long-beaked echidna (Z. bartoni), and the western long-beaked echidna (Z. bruijni). Unfortunately, they are all classified as critically endangered, threatened by deforestation from logging and small-scale agriculture and hunting, as they are eaten by local people. Another victim of the exotic pet trade is the Javan slow loris, a primate is native to Java, Indonesia where they live nocturnally in forests. The Javan slow loris is considered to be toxic, as they have brachial glands above their elbow that produce a secretion which they lick and mix with their saliva. Some tests show that this mixture is displeasing for predators; causing clouded leopards, sun bears, and binturongs to retreat when presented with it. In the pet trade, slow lorises often have their teeth removed because of this toxic mixture as it can enter the bloodstream when they bite and can cause anaphylactic shock. Toothless lorises cannot be released back into the wild as they will not be able to feed nor protect themselves. 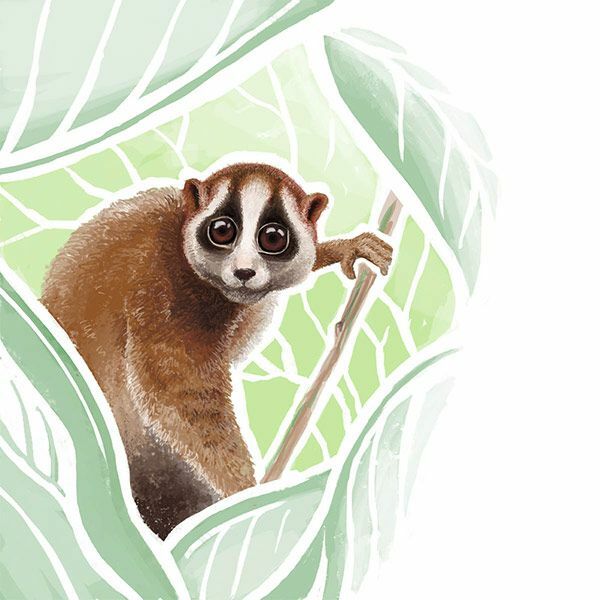 Among the pet trade, Javan slow lorises are also hunted and used in traditional medicine because of myths that they ward off evil and have magical properties. Due to the rapid population decline, conservation efforts are unsuccessful as reproduction in captivity is difficult and there are no captive breeding projects. Although illegal in many countries, hawksbill turtles have been exploited by humans all around the world. Their shells are used for the scutes and are also the primary source of the decorative tortoiseshell material, their meat is considered to be a delicacy in some countries. Despite their worldwide distribution, hawksbill turtles are critically endangered with no significant population increase since 1996. Their biggest threats are the tortoiseshell trade, egg collection, slaughter for meat, entanglement, ingestion of marine debris, oil pollution and destruction of foraging and nesting habitats. 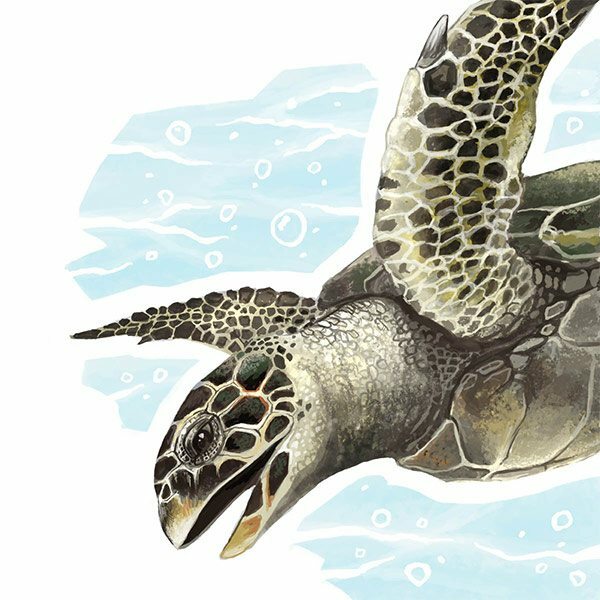 As exploitation of sea turtles and their eggs has been banned in numerous countries, various sanctuaries are established to protect the hawksbill turtle and raise public awareness. With a population drop of an estimated 5,000-10,000 in the 1940s to fewer than 265 in 2006, the wild population of gharials are comprised of many fragmented subpopulations. The population decline is due to many factors, including a decrease in habitat, water pollution, egg collection and hunting. They are hunted for their skin, as trophies and for their use in indigenous medicine. Fishing and the use of gill nets; a very effective net that can be positioned across rivers or water bodies to catch fish, designed for fish to become trapped and tangled in the mesh, these fishing nets are illegal in some U.S. states and heavily regulated in others. With their distribution being limited to just 2% of their former range, gharial populations are dwindling. Habitats are decreasing due to dams, barrages, and artificial embankments. These crocodilians cannot move effectively on land making it hard for them to find new habitats. 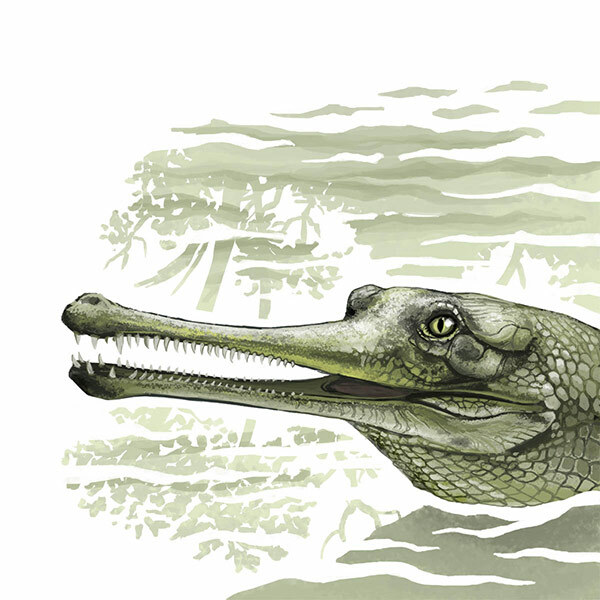 Furthermore, water pollution from toxic heavy metals such as lead and cadmium have been found in gharial autopsies. These metals could have occurred naturally or have entered the water system through industrial waste or other human activities. The gharial is Critically Endangered and various conservation programs have begun in India and Nepal, and there are also worldwide breeding projects. The angelshark is a bottom-dwelling nocturnal ambush predator of the continental shelf. They are named after their long pectoral fins which resemble angel wings. 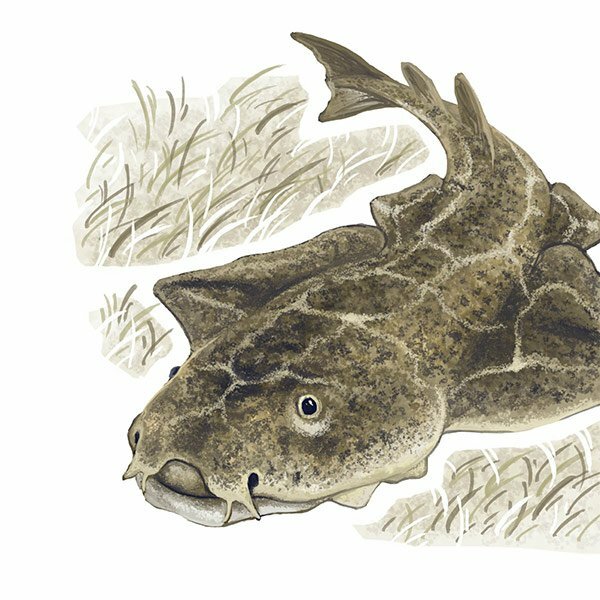 Angelsharks are well adapted for feeding on fish on the seafloor where they bury themselves in the sediment and wait for prey to swim by. Due to this behavior, they are often caught as bycatch in trawl fishing. Furthermore, they may be intentionally hunted as a source of shark liver oil and fishmeal. They are often sold as fresh, dried or salted as food under the guise of monkfish (Lophius spp. ), which biases the report of population monitoring. In some parts of the world, this species cannot be retained on boats, sold or transferred to land and must be released alive and unharmed. Unfortunately, it only gives birth to 7-25 pups every other year, slowing down population recovery efforts aimed to improve the species’ stability. Modern coelacanths are remarkably similar to their ancient ancestors. They first appeared around 390 million years ago and it was thought that they were wiped out in the Cretaceous-Paleogene extinction 66 million years ago. 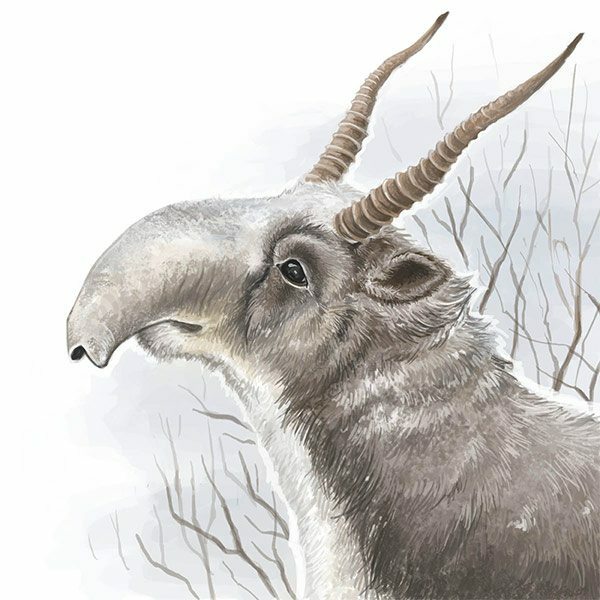 It is considered an example of Lazarus taxon, an evolutionary line of of animal that “rises from the dead” and appear much later in the geologic time scale. Today, there are two species of coelacanth and both are threatened and considered to be the most Critically Endangered taxonomic order of animals. While they are sometimes caught as bycatch from deep water shark nets and night fishing, coelacanths are sought after by aquariums despite the fact that not one has ever been kept alive for display. 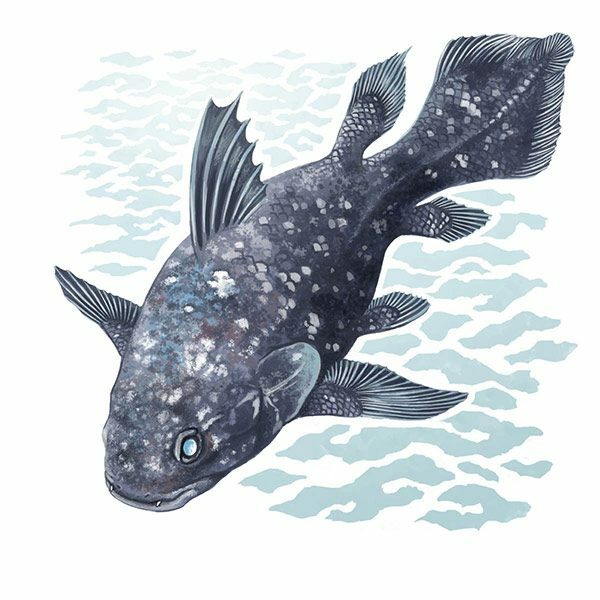 Due to the isolated nature of its habitat, very little is known about coelacanths which makes conservation efforts tricky. They are known to give live birth to their young, a strategy uncommon for fish.